The priority of a task, specified by the sequence number, plays a crucial role in just plan it since it determines the order in which the jobs are worked off. The lower the sequence number, the higher the job's priority and the earlier this job gets the required resources, meaning that when e.g. Job 1 and Job 2 compete for the same resources, Job1 will get assigned these resources earlier because Job 1 has a higher priority. In our terms, Job 1 has a lower “sequence number” than Job 2. Jobs that will be finished past their due date are indicated by a red exclamation mark in the left hand table, a red due date symbol and red task bars (of those tasks that finish past the job's due date). Since changing the priority will directly affect the operations of lower priority you can click in the "Essentials" tab of the menu ribbon to highlight the tasks affected by plan modifications in order to understand which orders had been pushed out to have the other job finished earlier. 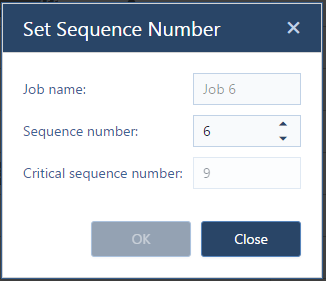 The "Set Sequence Number" dialog offers a decision support functionality: The "Critical sequence number" provides decision support being aligned with the decision alert mentioned above. In the illustration above, job 6 has sequence number 6. The decision support in the form of the "critical sequence number" = 9, tells you that this is the highest possible sequence number (i.e. the lowest possible priority) at which the job will not be late. If you change the job status you have to be aware of the fact that in doing so you will also change the sequence number. Changing the status from quoted to released or ordered, will give a lower sequence number = higher priority to the job, changing, e.g., the job status from released to ordered or quoted will cause the sequence number to be increased, meaning the job gets a lower priority. The re-categorized orders will get the highest sequence number = lowest priority in their new category.